What to look for as a sewer? One of the most important relationships you have is with your sewing machine. But before you run out and buy the first shiny model that catches your eye, avoid the pitfalls that come with hasty or uninformed buying decisions. 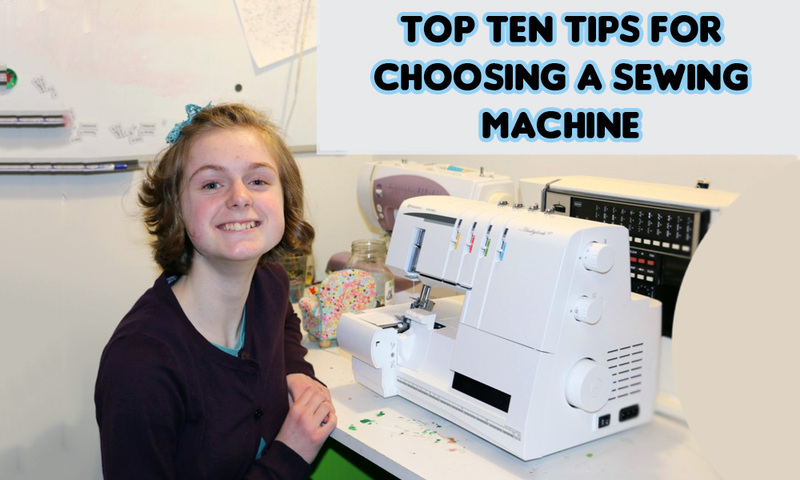 Follow these top ten steps to ensure you and your new machine are a match made in heaven. Tip #1 - Take a Sewing Personal Inventory. Do you have more ideas than time or money? You might want to reupholster the living room and make every item of clothing you wear, but you have to face facts. You also have a job, a family and a life. You can’t shackle yourself to your sewing machine into the wee hours every night. If your sewing life revolves around making kitchen curtains, a fashion forward outfit every few months or mending the kids clothes, then step away from the AED 11,000 Bernina with all the bells and whistles you will never use. Instead, head over to the great, lower priced brands that will serve you well without torturing your wallet. On the other hand, perhaps you’ve been sewing for a while and you have found a life-long avocation. You sew everything you and your family wears, however, your old machine is slowing you down. In this case, you may need to think about a serious investment in electronics. Or, you are somewhere in between, struggling to match a budget, an avocation and a machine. Whether you can sew a garment with your eyes closed, or are a sewing newbie, take this quiz to help you choose a sewing machine that is right for you. Tip #2 - Don’t buy more machine than you need and don’t buy less. The latest computer-driven sewing machines will do everything but paint the bathroom. But you don’t want to pay top dollar for an embroidery function you will never use. On the other hand, it doesn’t make sense to cut corners thinking you’ll make buttonholes by hand rather than shell out extra money for the state of the art, one-step buttonholer, only to discover that you have neither the skill, time nor patience to make them by hand. Hence, your projects languish as UFO’s (unfinished objects). On the other hand, if you make most of your family’s clothes and home decor items, you want every bell and whistle that will make your work easier. You may spend a little more up front, but it will pay off in time saved and more projects completed. Put your money into something you (and your budget) can live with over time rather than tearing your hair out because the stitches aren’t even or the bobbin winder makes you say bad words. Make a list of the projects you expect to make and the features necessary for a professional job. Keep it handy as you read on. Tip #3 - Mechanical or Electronic? Choose a model that is right for you. If you are mainly interested in mending clothes, running up simple curtains or holiday costumes for the kids, consider a mechanical sewing machine. They are budget-friendly, work well with a minimum of fuss and are reliable workhorses over time. The downside is that you have fewer stitch options and may find yourself using a lot of quirky attachments for special finishes rather than dialing in the computer. The dedicated needlemieister can find electronic beauties with enough computer power to set up a space station. Expensive, but they can give full range to creative expression offering a variety of stitches for complicated embroidery, tailoring, and allowing manipulation of heavy fabrics such as upholstery and leathers. Your ultimate choice will depend on a combination of need and budget. Of course, the more functions you want, the more you will pay. Tip #4 - Choose only the functions you need, with a little room to expand. You can sew everything you need with only a straight stitch, zigzag and buttonholer. But if you add a few extra, you have the chance to branch out and try new skills. Here’s what’s available: One step buttonholer. Whether you dial in the feature or use an attachment foot, this feature makes a buttonhole without you having to remove the fabric so all buttonholes are uniform. Tension. You can forgive a lot in a sewing machine as long as it maintains good tension. You want an even stitch length, no skipped or loopy stitches, no bunching of thread on the underside of the fabric or puckers in your work. Speed control. Controls the speed of the fabric for smooth, even stitching with no stop and go bursts. Reverse: An absolute necessity, missing on many older, used machines. Needle threader/cutter. Not a deal breaker but nice. Bobbin: Top loaders are easier, front loaders produce nicer work. Adjustable presser foot: Allows you to regulate the pressure on your fabrics from light to heavy. Feed dog adjustment. Important for embroidery or darning options. Needle down: Allows you to ease up the pressure foot and turn corners without an extra stitch. Tip #5 - Sewer friendly. Good ergonomics: adequate light, light weight without being flimsy so you can carry it without straining your back; fits in your space; if it is portable, has a case with a handle; once you get it out of the case, easily maneuvers back in; pressure foot responds easily with no bucking and stalling; controls are easy to understand and use; can use reverse and sew at the same time; can read the displays; hands and multiple layers of fabric fit easily around and under the presser foot. Tip #6 - Read Reviews. Check review sites to see what reviewers and other users have to say about the machines you like. Tip #7 - Kick the tires. Take it for a test drive. Make sure it doesn’t vibrate and walk across the table if it is a portable model. Should sound like a quiet, efficient machine, not a jackhammer. Should feel solid, well constructed and produce even top and bottom stitches with clear and easy to follow instructions. Do comparative shopping and test machines at several dealers. Try to break it—push and pull all the levers and attachments to make sure they won’t break easily. Tip #8 - Consider a used or refurbished machine. When you find this machine limiting you, sell it and trade up. Tip #9 - Find a reputable dealer. Search online or brick and mortar for service, warranty and competitive pricing. Make sure there is a service shop in your area if you buy online. Tip #10 - NEVER BUY A MACHINE WITHOUT A MANUAL. Your manual will save many hair-pulling sessions when you set up your new machine. There just is no other way to figure out the bells and whistles. Even if you’ve taken a class, chances are that down the road you will have forgotten how to do a special stitch or fix a stuck bobbin. If it is a used machine and the manual is lost to history, check your machine’s website to see if they have downloadable manuals, or can otherwise make one available. Check also eBay, Craigslist and sewing forums to see if you can locate one.